When Jesus met with his disciples near Caesarea-Philippi, he inquired concerning how others were identifying him. Several opinions were proffered. He then pressed for their view. Peter responded, confessing Jesus as “the Christ, the Son of God.” The Lord pronounced a blessing upon his apostle and declared that upon this “rock” (the truth of that declaration) he would build his church. It represents the body of Christ worldwide, over which the Lord functions as head (Mt. 16:18; Eph. 1:22; 1 Tim. 3:15). The expression can refer to God’s people in a given region (Acts 9:31, ASV, ESV). Frequently, it depicted a local congregation of Christians (1 Cor. 1:2; Rev. 1:11). It could also signify a group of the Lord’s people assembled for worship (1 Cor. 14:34-35). Supposedly, they argued for a meaning of ekklesia that is not consistent with the New Testament use. These new voices contend that ekklesia “does not mean ‘the called out’ as some mistakenly suggest,” and “it never meant that” (emphasis added). An article appearing in the Gospel Advocate vigorously pressed for this conclusion. “Many adhere to the view that ekklesia means the ‘called out.’ They emphasize a complete theological thought, namely that the church is composed of those who are called out of the world (the kingdom of darkness) and are called into the body of Christ (the saved). Others, including me, disagree with loading the word with such theological meaning based upon etymology. For these, etymology plays no role in determining the meaning of ekklesia in the New Testament. The definition is simply ‘assembly,’ ‘congregation,’ ‘meeting’ and ‘church’” (Redden, 2010, 30; emphasis added). The writer then calls attention from a number of scholarly sources to the danger of going overboard in the matter of etymology, which most serious Bible students recognize. 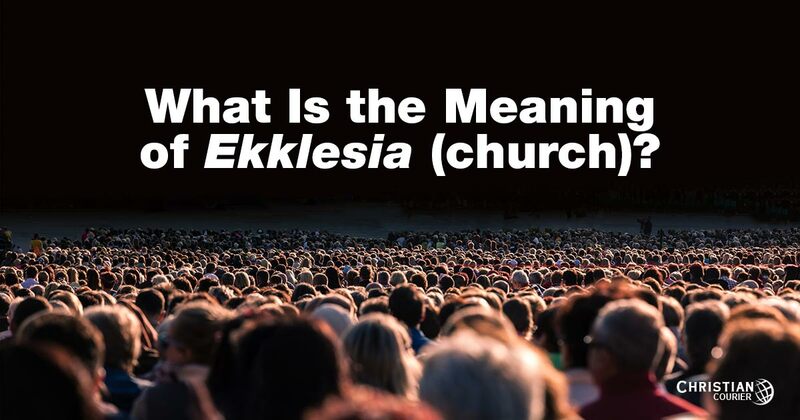 What the writer failed to mention, however, is that there is a considerable body of evidence directly antagonistic to the premise of his article regarding the term ekklesia. My criticism is not that these brothers are uncomfortable with the “called out” sense of the term — that is their privilege, however incorrect I believe it to be. It is their inflexible view, one that ridicules a considerable body of scholarship that conflicts with their personal perspective that I feel is misguided. Either they are unaware of the wider range of scholars who dispute their theory or else they have fixated on a position and are not open to any other possibility. In the third edition of his Historical Grammar, A. T. Robertson stated that “originally ekklesia was a ‘calling out’ of the people,” but “that usage soon passed away.” He opted for “assembly,” but conceded that there are New Testament passages “where the idea of assembly is impossible,” e.g., Acts 8:3 (1919, 174; emphasis added). J. W. Roberts argued the assembly-only theory in 1972 (27-36), as did Everett Ferguson two decades later (1996, 130ff). Respectfully, I would like to offer the following response. First, the idea of being a “called out” body and an “assembled” body are not mutually exclusive expressions. The single term can embrace both ideas. The renowned scholar Adolf Deissmann stated that ekklesia was used with “the certain conviction that God had separated from the world His ‘saints’ in Christ, and had ‘called’ or ‘convened’ them to an assembly, which was ’God’s assembly,’ ’God’s muster,’ because God was the convener” (1927, 112). Throughout the Greek world and right down to NT times (cf. Acts 19:39), ekklesia was the designation of the regular assembly of the whole body of citizens in a free city-state, “called out” (Gr, ek, “out,” and kalein, “to call”) by the herald for the discussion and decision of public business (Lambert 1929, 651). The citizens [in Greek society] are the ekklesia, i.e., those who are summoned and called together by the herald. This teaches us something concerning the biblical and Christian usage, namely, that God in Christ calls men out of the world (1965, 513). The founding of the ekklesia by Jesus at Mt. 16:18, to which appeal is so often made, consists solely and simply in this process of separating and concentrating His band of disciples (526). The noted British scholar, Nigel Turner, described the first-century ekklesia as “an invited concourse of people” (1981, 68; emphasis added). R. C. H. Lenski contended that the etymological sense of ekklesia still lingered in New Testament literature. He declared that the ekklesia consists of all “who are called out of the world in the kingdom of Christ’s own” (1943, 627). The meaning of the word ekklesia would thus seem to be, in the N.T., the whole company of God’s elect, those whom he has called to be his people under the new dispensation, as he did the Israelites under the old (1968, 322; emphasis added). G. W. Kirby, distinguished scholar of Cambridge University, observed that ekklesia is used in the Greek Old Testament for the assemblies of Israel when they “gathered before the Lord for religious purposes.” He goes on to point out that “the Jews had been ‘called out’ from the nations to be God’s special people (Rom. 9:4)” (1975, 846). In his discussion of Matthew 16:18, D. A. Carson, a recognized scholar at Trinity Evangelical Divinity School, said that “the messianic reign is calling out the messianic people” (1984, 369; emphasis added). It has not in it that exclusive sense. It means a body of people who have been “summoned out” of their homes to come and meet with God; and both in its original Greek and Hebrew usages, that sense was not exclusive but inclusive (1964, 70; emphasis added). In other words, both ideas, “out of the world” and “summoned to assemble,” are inherent in the original word. “Usually the Greek term represents God’s people as distinguished from others, thus called out (ek ‘out’ and kletos ‘called’) of the world” (Myers 1987, 215). It is very difficult to see how either the term “assembly” or “congregation” can, in any fair sense of those terms, be applied to the church on a universal scale. The universal church is never assembled. It is not an unassembled assembly. Cremer defined ekklesia in its universal aspect as “the entire congregation of all who are called by and to Christ, who are in the fellowship of His salvation” (1962, 334; emphasis added). The teaching that Christians have been called from the world into a relationship with Christ is profuse in New Testament literature (Acts 2:39; 1 Cor. 1:26-29; Eph. 4:1; 2 Thess. 2:14; 2 Pet. 1:10). These texts perfectly complement the meaning of the original term rendered “church” in the New Testament. In his recently published book, Mounce’s Complete Expository Dictionary of Old and New Testament Words, William D. Mounce, former professor of New Testament and director of the Greek language program at Gordon-Conwell Theological Seminary and New Testament chair of the English Standard Version, says that ekklesia signifies “to call out” — so “the church is the ‘called-out ones’ of God” (2006, 110). It is quite possible that some who have fallen under the influence of a few scholars who have a restricted view of the Greek term ekklesia need some moderation and balance in their discussions of this important biblical word. Respectable scholarship does not rule out viable options that may vary from their preference. Barclay, William. 1964. New Testament Words. Philadelphia, PA: Westminster. Carson, D. A. 1984. Matthew. The Expositor’s Bible Commentary. Frank Gaebelein, ed. Grand Rapids, MI: Zondervan. Deissman, Adolf. 1927. Light From The Ancient East. New York, NY: George Doran Co.
Ferguson, Everett. 1996. The Church of Christ. Grand Rapids, MI: Eerdmans. Kirby, G. D. 1974. Zondervan Encyclopedia of the Bible. Vol. 1. Merrill Tenney, ed. Grand Rapids, MI: Zondervan. Lambert, J. C. 1929. International Standard Bible Encyclopedia. Vol. 1. James Orr, ed. Grand Rapids, MI: Eerdmans. Lenski, R. C. H. 1943. St. Matthew’s Gospel. Minneapolis, MN: Augsburg. McClintock, John and James Strong. 1968. Cyclopedia of Biblical, Theological, and Ecclesiastical Literature. Vol. 2. Grand Rapids, MI: Baker. Myers, Allen C. 1987. The Eerdmans Bible Dictionary. Grand Rapids, MI. Eerdmans. Redden, Rob. 2010. “Ekklesia and Etymology.” Gospel Advocate. April. Roberts, J. W. 1972. Restoration Quarterly, 15, 27-36. Robertson, A. T. 1919. A Grammar of the Greek New Testament in the Light of Historical Research. London, England: Hodder & Stoughton. Thayer, J. H. 1968. A Greek-English Lexicon of the New Testament. Edinburgh, Scotland: T. & T. Clark.